When trying to incorporate all the amenities of a full sized house into a space the size of a large bedroom, there are many considerations. One of the most important of these is cabinetry and storage. Understanding the restrictions and construction principles of cabinetry in a non-uniform space will give you the skills needed to conceive of and build interiors for Tiny Homes and Boats. This intensive course is designed for people who already are DIY'ers or build cabinetry and furniture for large homes and wish to make the switch to building tiny homes and boat interiors. Students will learn the differences between regular Home furniture and Tiny Home furniture and Ships Cabinetry, how to organize and build a space within a nonlinear structure. There will be a focus on how cabinetry and furniture should be built for a concentrated space with special consideration for withstanding extreme environments and jarring travels. We will also cover dimensional differences and multi-functional furniture. We’ll explore the construction of furniture and cabinetry and how it differs from standard assembly. Students will finish this course understanding not only how to build ergonomic and attractive interiors, but also how to revitalize a dysfunctional small space. 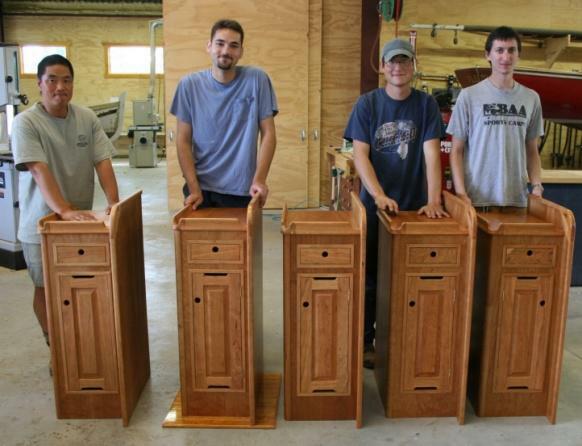 Pre-requisite courses: Introduction to Woodworking or equivalent training and/or experience in building cabinetry/furniture with an interest in learning how to transfer those skills to building in Tiny Homes and Boat Interiors. This course can also be tailored as well, if the general level of students have minimal experience in woodworking, adjustments to the program can be made to fit anyone, check with Tony if you have any questions for qualifying. Tuition and Class size: $850 - Five day course. The minimum number of students for the class to run is 2, to a maximum of 6 students. Materials: Some personal hand tools needed; student tool list provided with the registration package. The school will provide all other hand/power tools and machinery necessary, as well as a printed or PDF version of the course handouts. Materials Fees: $180 for wood and materials; however if the school keeps the end project the extra fee may be waived.